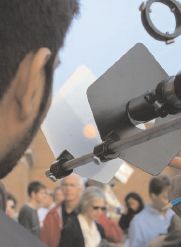 The astronomy department provided four different telescopes for the public to view the transit of Venus Tuesday. Hundreds of people from all over Maryland and Virginia flocked to the university early Tuesday morning to view the transit of Venus, one of the rarest natural phenomena occurring this year. The transit, which last took place Dec. 6, 1882, occurs when Venus's orbit takes it directly between the Earth and the sun. For almost two hours, the silhouette of Earth's closest planetary neighbor was visible against the morning sun. Transits of Venus take place in pairs spaced 8 years apart, every 120 years, and in the past have been instrumental in key scientific discoveries. In the 1700s and 1800s, scientists used data from the transit to accurately calculate the value of the Astronomical Unit, the distance from the Earth to the sun. With this value they were also able to calculate the distances between all the other planets in the solar system. In order to view the transit, the astronomy department set up an impressive array of telescopes on the fifth-floor balcony of the Plant Sciences Building. Observatory Director Elizabeth Warner, who organized the event, estimated between 300 and 500 people came to look at Venus. Mike Marceau, a former university student from Adelphi, decided to "join the mob to see something that doesn't happen everyday." Those in attendance, some of whom arrived as early as 5 a.m., were there to witness a piece of history. Diane Chu, of Laurel, attended with her two children because the transit is "a once in a lifetime event." The transit was first visible to those on the balcony around 5:50 a.m., when the morning haze began to disappear. For a few short minutes, Venus was visible to the naked eye against the glowing backdrop of the sun. The astronomy department had four telescopes set up to view the event. Attendees were able to look through two that were fitted with solar filters, while a third projected the image onto a piece of white paper. The images collected by the fourth colossal telescope set up high above the heads of the people milling around on the balcony, were viewed on a monitor. Observers in Maryland and all along the East Coast were only able to see the last two hours of the transit, which took about six hours to complete. The next transit will occur in 2012, but unlike this year's, it will occur in the evening hours. According to Warner, the best seats for that show will be in Hawaii.